possibilities :: shaped, steeked, striped vest, originally uploaded by earthchick. I am now obsessed with steeking all the things. 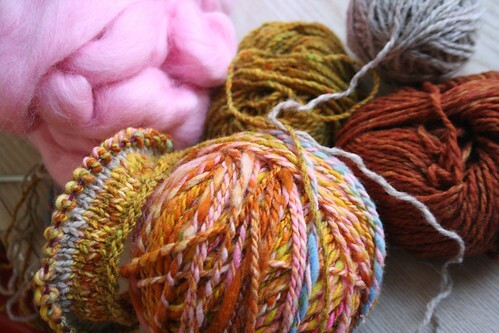 I’m dreaming of more handspun stripes, this time for me. This handspun is some of my very first – 150-ish yard of 2-ply Hello Yarn “Thrive.” It’s been hanging out on a shelf, making me happy for more than 2 years now, and I think it finally wants to become something more. I love the way it looks with the golden yellow Plymouth Tweed I have leftover from my Allegheny dress. I also like it with the orange Skye Tweed leftover from my (unfinished) Vestvember vest from two years ago (which will be finished this month! I think). I tried it out with that oatmeal Skye Tweed as well, and it’s a definite maybe. That sweet pink is some Louet Corriedale that Heather gave me; I’ll be spinning it soon. So many possibilities for how I stripe this thing, all of them delicious. I think you should just use them all but the gray. It would be the happiest steeked sweater ever!! You could do patterned sections too for extra fun.